The Miami is an apartment building situated in the centre of Estartit within a short walk of the town and beach. The complex comprises a selection of 1 & 2 holiday apartments for rent. The Miami comprises two blocks each with its own communal swimming pool. The main block has a reception area, WIFI and seating area. This newly fitted Ground Floor Apartment at the Miami in Estartit has air-conditioning and a private terrace. 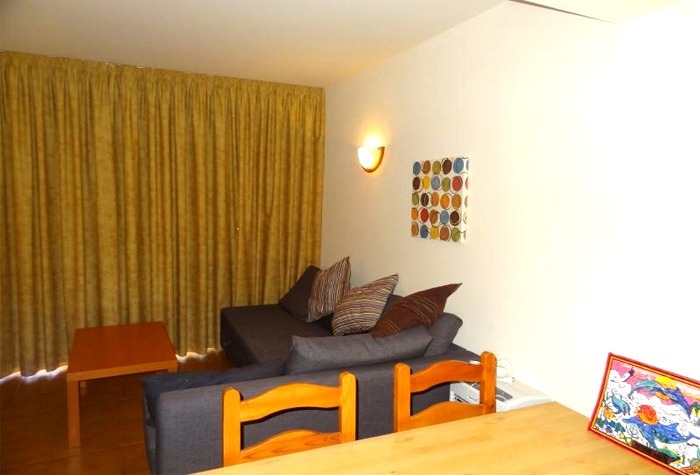 The apartment has been completely refurbished and has a fitted kitchen with oven, hob and fridge freezer. Open plan lounge / dining area with TV and air-conditioning unit. The bedroom has twin beds and there is a full bathroom. The apartment also has free WIFI. The swimming pool area is about 20 metres away from the apartments front door. These 1st, 2nd and 3rd floor Miami Apartments are suitable for up to 4 people: The holiday flats are on the 1st, 2nd & 3rd floor and all have balconies and use of the communal swimming pool. The apartments have a twin bedroom, bathroom (bath with overhead shower, basin & WC), Equipped kitchen. Use of a communal pool, BBQ area and free WIFI internet connection. 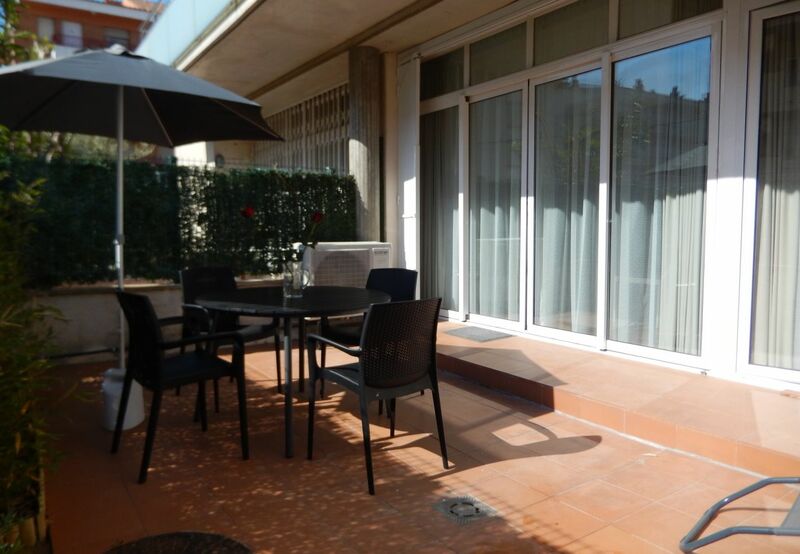 This Holiday Apartment is located at the Miami II in Estartit just 250 metres from the beach. The apartment has a kitchen, lounge / dining area, bedroom and bathroom. The complex has use of a communal pool and gardens great for sunbathing. Just a few minutes walk from Estartit town centre. The apartment has an open plan living area with kitchen equipped with cooker, microwave and fridge/freezer. Dining area and lounge with sofa bed, TV and doors to the furnished terrace. 1 twin bedroom and a bathroom. Washing Machine. Air-conditioning in the living room. Garage parking in the same building. Guest have use of the communal swimming pool. This 1 bedroom vacation apartment of 35 m2 is located at the Miami II complex in L'Estartit just 350 metres from the beach. The apartment has an open plan living area with kitchen equipped with cooker, microwave and fridge/freezer. Dining area and lounge with sofa bed, TV and doors to the furnished terrace. 1 double bedroom and a bathroom. Wifi is available on request and guest have use of the communal swimming pool. The apartment has a kitchen, lounge / dining area, bedroom and bathroom. The apartment has a flat screen TV, washing machine, WIFI is available at extra cost. The complex has use of a communal pool and gardens great for sunbathing. Just a few minutes walk from Estartit town centre. This 1 bedroom apartment is situated in the Miami 2 complex in L'Estartit just 350 metres from the beach. The apartment has an open plan living area with kitchen equipped with cooker, microwave and fridge/freezer. Dining area and lounge with sofa bed, TV and doors to the furnished terrace. 1 twin bedroom and a bathroom. Washing Machine. Wifi is available on request and guest have use of the communal swimming pool. This 1 bedroom holiday apartment is located on the ground floor at the Miami II complex in L'Estartit just 350 metres from the beach. The apartment has a spacious 9 square metre terrace. Open plan living area with kitchen equipped with cooker, microwave and fridge/freezer. Dining area and lounge with sofa bed, TV and doors to the furnished terrace. 1 double bedroom and a bathroom. Wifi is available on request and guest have use of the communal swimming pool. The Miami apartments are well located just 300 metres from the beach and shops.�We have two lovely ground floor apartments (one pool facing and one road facing) completely refurbished with fitted kitchen with oven, hob and fridge freezer. Open plan lounge / dining area with TV and air-conditioning unit. The bedrooms both have twin beds, there are two bathrooms. Use of a communal pool, BBQ area and free WIFI internet connection.�We have various 2 bedroom apartments with air conditioning plus a sofa bed in the lounge area.�Each apartment is fully equipped with cooker, fridge freezer, washing machine, TV, microwave, and either terrace or balcony. Holiday apartment at the Miami II complex in Estartit. The apartment has has 2 bedrooms (one with 2 twins beds, the second with bunk beds) plus sofa bed, kitchen with oven, bathroom plus washing machine. As you enter the apartment you will find the lounge/open plan kitchen, bathroom and balcony overlooking pool. It is ideal for couples and young families.